In an ideal world you would begin using XpertMart™ just before opening your store for the very first time. And taking the fantasy one step further, in this ideal world all of your merchandise would arrive with tidy Receipts you could enter into the sytem. This is because, as you may recall from the Costs topic, the only way to enter or modify a cost into the system is through a Receipt or, less ideally, through a Cost Adjustment. If you do not use one of these two methods, the system considers the cost of the merchandise to be $0. Now lets fast forward to the real world. 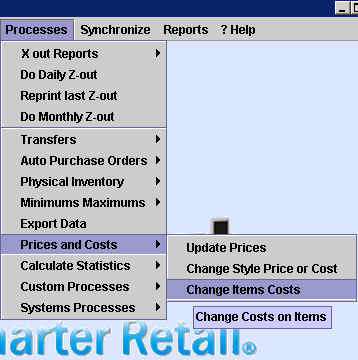 Chances are, you have been running your store for many years and XpertMart™ is not your first inventory control system (though we are confident it will be your last!) You have merchandise sitting around everywhere and don't have time to recreate this ideal world, especially not when you have customers who are eager to pay for this merchandise and take it. But not so fast! If you just begin selling merchandise and do not take the time to properly set your costs first, your profit margins will be absurdly high and you will have no idea of spending all that time running your store is actually a good idea. So let's go step by step and make sure you setup your initial inventory the right way. Insead of recreating Receipts for all of the merchandise you have in stock, what you want to do is use an Adjustment to enter your initial inventory into the system. Refer to the Adjustments topic for more details. This will set the stock levels for every Item correctly. However, Adjustments do not change the cost of an item one way or another. (Refer to the How Transactions Affect Inventory topic to learn more). Since you are not using Receipts, the only way to change the Inventory Cost of the Item is to use a Cost Adjustment. Since it would take far too long to make Cost Adjustments for all of your merchandise, there is a simple way to make mass changes to the cost of items. Under the Processes>Prices and Costs menu, select Change Items Costs, as shown below. The screen that opens up gives you several options for changing prices or costs. (To learn more about the other options available in this menu read the Mass Changes to Prices and Costs topic). In this particular case, what you want to do is take the Order Cost of all Items and "apply" it to the Inventory Costs of all Items. In other words, in the absence of Receipts for your initial merchandise, you are telling XpertMart™ to assume that all merchandise was received (Inventory Cost) at the exact same cost you expect to receive future merchandise (Order Cost), i.e. there were no variations in cost. Once you press <Yes>, you will see the XpertQuery™ screen open up giving you the option to apply this change to only select merchandise. If you are running this process to set the Inventory Costs of all of your merchandise you will want to just press <OK> and not define in filtering criteria. IMPORTANT NOTE: Obviously you will want to exercise extreme caution when running this process. It is a sledgehammer, not a scalpel. If you run this process after you have been inputting Receipts into XpertMart™, you will overwrite the moving average (Inventory Cost) that XpertMart™ has been building for each of your Items. You will be back to square one and have a less realistic picture of your costs and, therefore, your profits. In an ideal world (we're back!) you will never have to run this process once you have entered all of your initial inventory into the system.